W herever you are on your faith journey you’re welcome at St Andrew’s – wherever you’ve come from, wherever you’re going, whatever you believe, whatever you don’t believe, we’d love to see you. We celebrate Communion on the first Sunday of the month (except January), on Maundy Thursday, Easter Sunday and Christmas Eve. St Andrew’s is an open community. Everyone is welcome to take part in Communion. St Andrew’s theology is progressive and inclusive. Our Gatherings draw on a range of influences. We appreciate the riches of the ancient Celtic tradition. We embrace theological insights of the continually reforming Reformed tradition. In particular we follow the eight emphases of progressive Christianity. We use contemporary prayers, poems and music from Aotearoa New Zealand and Australia. Some are created by our own minister and people. Our Gatherings are works-in-progress. We strive to express faith and spirituality which are relevant to now, as well as honest to God, though their roots might be ancient. We aim to unpack the ‘baggage’ which has gathered around words and customs in the Church. We want to sing and pray and speak in ways which fit this time and this place – 21st century Aotearoa New Zealand. Lay people are actively involved. Each Sunday volunteers contribute by reading Bible and contemporary readings, talking with the children and preparing prayers of the people. Occasionally a group prepares and leads the service, often using creative and non-traditional forms of liturgy. Through September, we celebrate creation and creatures through different themes. During Creation the banners and candles in the church are blue. This is the season of preparation which begins four Sundays before Christmas. 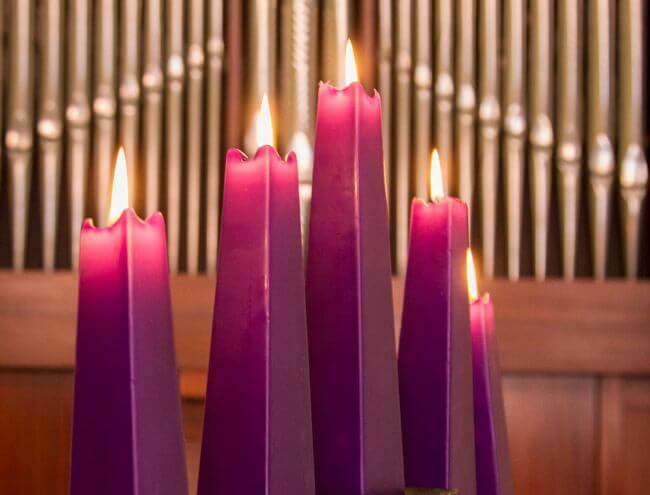 We lights one candle of the Advent wreath each week for the themes of Love, Hope, Joy and Peace. During Advent the banners and candles in the church are purple. This includes Christmas Eve, Christmas Day and the 12 following days of Christmas (one to two Sundays). In this season we celebrate God-with-us then and now. During Christmas the banners and candles in the church are white and gold. In these several weeks we reflect on the enlightenment which is for all. Epiphany’s length depends on the dating of Easter. During this time banners and candles in the church are green. This period runs from Ash Wednesday to Easter Saturday. Its dating is flexible due to the moveability of Easter. During the six Sundays of Easter preparation in Lent, we follow Jesus’ journey to Good Friday and renew our commitment. During Lent the banners and candles in the church are purple. The 50 days of Easter include eight Sundays. From Easter Day to the Day of Pentecost, this time celebrates new life springing from death. Banners and candles in the church are white. See our welcome pack for more information.